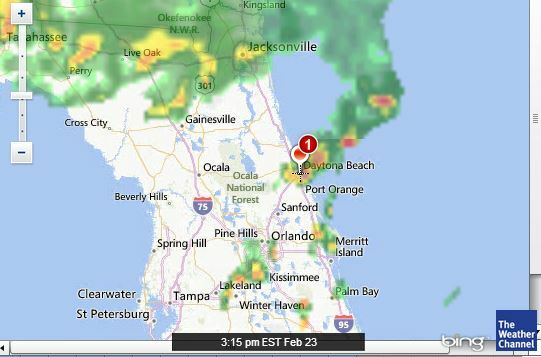 Weather for the Daytona 500: Will it rain during the race? The 2014 Daytona 500 will likely start on time today, but that does not mean we won’t have to stop The Great American Race for a rain shower or two. NASCAR has “Air Titan” on hand in case there is a shower to speed up the track drying progress. According to Brian Neudorff, who is known in the NASCAR world as “The Unofficial NASCAR Meteorologist,” the race will likely start on time at 1:30 pm/ET, but he is tracking storm development for later in the race. “To me, it appears most of the rain to the north stays north. More concerned about later development this afternoon/evening #NASCAR” he said on Twitter. Looking at radar, the chance of rain is between 40% and 50% between the hours of 2pm/ET – 5pm/ET. The chance of rain drops to lower than 30% after the 8pm/ET hour.